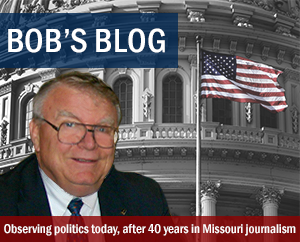 Stalking victims are asking legislators to strengthen Missouri’s laws to protect the innocent from their aggressors. Carol Cromer is a victim survivor. She says she married a policeman who soon became a controlling abuser. She says after the marriage, she couldn’t go anywhere without his consent; he sifted through her car, her phone records, followed her. When he threatened her with a gun, she decided to leave. That’s when the stalking began. The stalking and terrorizing only escalated after restraining orders were filed with the authorities. He followed her, threatened her and sent letters, and did the same to her grown children. She says at one point, her children’s cars were set on fire, her daughter’s home set on fire. None of it could be traced to him, therefore, no charges were filed against him. He even sent letters to her family explaining why he had to kill her and then kill himself, ordered instructions for their funerals, down to the very clothes they should wear. Cromer says it took a full year to get an order of protection against him … because he was a policeman, he knew all-to-well how to work the justice system. She says after five years of living in fear for herself and her children, her ex-husband took his own life. 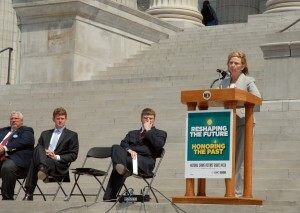 Cromer was speaking at the Capitol. She’s asking lawmakers to protect future victims by strengthening laws against stalking. Cromer was speaking at the Capitol for Missouri Crime Victims’ Rights Week, which is when the state recognizes the rights and protections guarenteed to crime victims in the state and across the U.S.
Also in attendance were several victims’ advocate groups such as MADD and Missouri Missing. State dignitaries in attendance included Governor Nixon, Attorney General Chris Koster, Dean Dankelson, President of the Missouri Association of Prosecuring Attorneys, Jason Lamb, Missouri Office of Prosecution Services, John Britt, head of the Department of Public Safety and George Lombardi, Director of Department of Corrections.